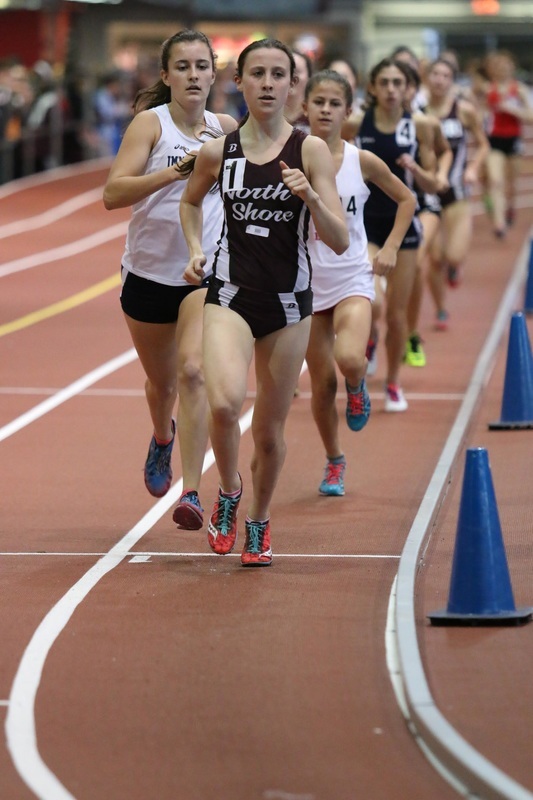 January 22, 2015 - North Shore High School senior and long distance runner Diana Vizza won the qualifying trial for the Millrose Games high school women’s mile last Wednesday, and as a result will be competing in what is regarded as a signature event at one of the most prestigious indoor track and field competitions in the nation. The achievement comes a month after Ms. Vizza won the New York State Class B Women’s Cross Country Championship and was named the Long Island Cross Country runner of the year by Newsday. During last Wednesday' s final, Ms. Vizza led the pack of fifteen of the region’s top runners for most of the race setting a fast pace throughout. After having been passed on the second to last lap and falling behind by several steps, with a strong kick she dashed down the stretch passing the second place runner on her last stride as she crossed the finish line in 4 minutes 54.34 seconds - a winning margin of 0.02 seconds, her fastest indoor mile ever by four seconds, the best time by any high school female runner in New York State this year, and the second fastest nationally. For over a century the Millrose Games have featured the top track and field athletes in the nation - from Olympic champions and world record holders to Division I Collegiate All-Americans and elite high school runners. This year, Olympic Decathlon champion and world record holder Ashton Eaton will be competing at the games. Held for most of its history at Madison Square Garden, the games were moved a few years ago to the world class track at the Armory in upper Manhattan. Her current training regimen, she explained to Northwordnews, involves two work-outs a day - one low impact session before school which usually involves swimming laps and spin biking, and then running after school - about 50 miles a week. Although her coach attributes her success to her work ethic and ability, Ms. Vizza is quick to return the favor recognizing his support. “Coach Levy has been at the core of my success, as he designs all of my training in meticulous detail and helps me maximize every day and seize every racing opportunity,” she said. “His commitment to coaching and helping each individual athlete improve toward their potential while strengthening our team cohesiveness is really extraordinary and I’m lucky to have him as such a valuable resource. In any sports program that has been as successful as North Shore’s track program, a tradition of excellence begets excellence - a truth recognized by both Ms. Vizza and her coach. “She has been wonderful in carrying on the tradition of excellence for North Shore High Schools track and cross-country teams,” Coach Levy says. Ms. Vizza cited that tradition in explaining her distance running achievements this year. She is the third North Shore distance runner in recent years to qualify for the Millrose Mile. In both 2011 and 2012, two former teammates – Brianna Nerud and Samantha Nadal competed in the event. Ms. Nadal, a good friend of Ms. Vizza and currently a member of the Georgetown University track and field team, won both times. Ms. Vizza will be attending Dartmouth College in the fall, “I hope to become a scientist one day and cure asthma,” she says. Be sure to tune in to NBC Sports network on Saturday February 20th to watch Ms. Vizza compete in the High School Women’s Millrose Mile. Her event is scheduled to start at 5:15 pm. NBCSN will be broadcasting the games from 4 pm to 6 pm.